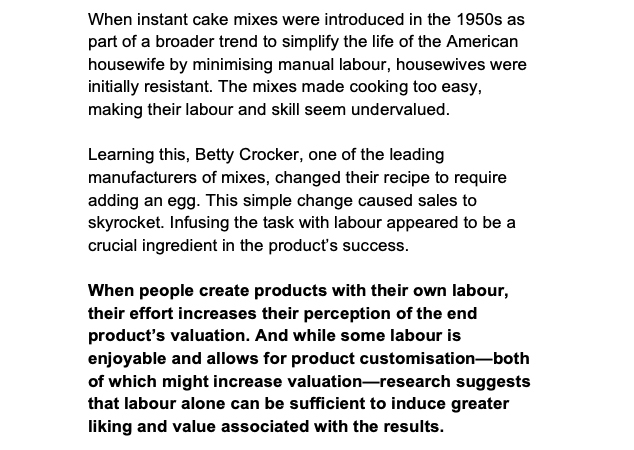 When instant cake mixes were introduced in the 1950s as part of a broader trend to simplify the life of the American housewife by minimising manual labour, housewives were initially resistant. The mixes made cooking too easy, making their labour and skill seem undervalued. Learning this, Betty Crocker, one of the leading manufacturers of mixes, changed their recipe to require adding an egg. This simple change caused sales to skyrocket. Infusing the task with labour appeared to be a crucial ingredient in the product’s success. When people create products with their own labour, their effort increases their perception of the end product’s valuation. And while some labour is enjoyable and allows for product customisation—both of which might increase valuation—research suggests that labour alone can be sufficient to induce greater liking and value associated with the results.